This is totally regional but if you’re a cycle guy/gal and live anywhere near Hampton Roads, the BMW Motorcycle Club of Hampton Roads and the Military Aviation Museum are co-hosting a charity ride in Southeast Virginia Oct. 8 to benefit the Wounded Warrior Project. First and foremost, it’s a great cause, of course. Check it out at the link above. And despite the group’s name, all types of motorcycles are welcome, says club member and Navy civilian Kelley Stirling — even though she motors aboard a BMW R1200GS. 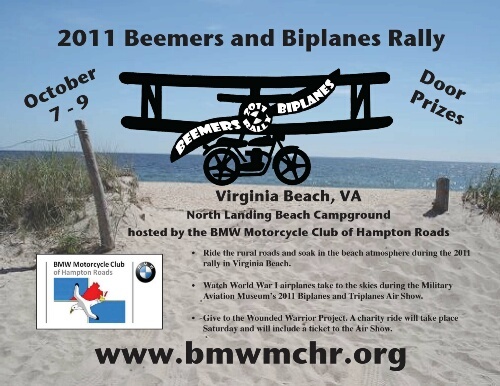 The ride costs $25 and registration begins at 9:30 a.m. on Oct. 8 at the North Landing Beach Campground on Princess Anne Road in Virginia Beach. The ride will end at the museum, where participants will be able to enjoy the Biplanes and Triplanes WWI Air Show at no cost. For more information, contact Kelley at 757-581-1030.